Self taught pencil artist. My favorite medium Prismacolor colored pencils and Graphite and charcoal pencils. I am an 58 year old self taught artist. I drew a lot when I was a youngster. I grew up with 4 other siblings, but being the middle child I always felt alone. Drawing was always a way to escape that loneliness. I was around five years old when I began to draw and I kept at it until around the age of fifteen. Then life around me starting happening and I laid it aside. Then of course I got married and I dabbled a bit with my drawing, but my husband didn't share in my passion for it and often criticized my work to the point where I didn't believe in myself. Now my life has changed, he has gone, and life has slowed down and I have picked it back up. I am starting to believe I can do this again. 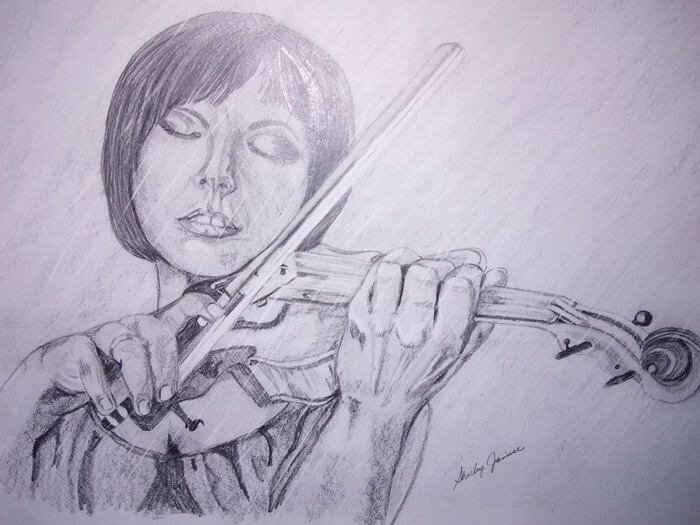 I drew "Playing in the Rain" from a photograph of a violinist. I felt her passion and deep love for what she loves to do in the photo. I wanted others to feel the same thing I did. I added rain to the picture to depict that even when circumstances are not as they should be, we will keep moving forward doing what we love. "14 x 17" on Strathmore medium drawing paper. Derwent graphite pencils.